Mule deer antlers “fork” as they grow. The average male deer weighs 200 pounds and the female deer weighs 150 pounds. Deer kill about 150-170 people each year, from car accidents, and because people underestimate how dangerous they really are. What does the mule deer eat? Mule deer eat a wide variety of plant foods, utilizing the food that grows where they live. Their diet consists of woody vegetation, plants, berries, acorns, apples and grasses. Mule deer usually live 9-11 years in the wild and can live to be much older when in captivity. How many mule deer can be born at a time? Usually two, although if it is their first time, they may have only one. Mule deer antlers “fork” as they grow. The average male deer weighs 200 pounds and the female deer weighs 150 pounds. The mule deer in the wild has several predators: humans, coyotes, mountain lion, eagles, bears, wolves, and bobcats. Mule deer have no upper teeth, only a hard palate. Deer kill about 150-170 people each year, from car accidents, and because people underestimate how dangerous they really are. 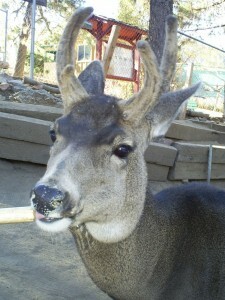 Bailey – is our oldest Mule Deer but she is still very young. She came to us in 2009 because someone found her as a baby wandering in a cul de sac in Fontana. She appeared to have no fear of people and the humane society picked her up and brought her to us. She was so friendly that we assume someone tried to keep her as a pet. Malibu – came to us near the end of 2011 and someone was raising him in their house as a pet. They had him for 7 months and then brought him to a rehabilitator since it is illegal to own any wild animal without the proper permitting in California. The damage was done though and because he was so imprinted, he will have to stay with us for the rest of his life.